TSN basketball analyst Jack Armstrong returns with his midweek thought on Jamal Murray's playoffs emergence, the injury to Boogie Cousins, the dominance of the Blazers' backcourt and more. 1. 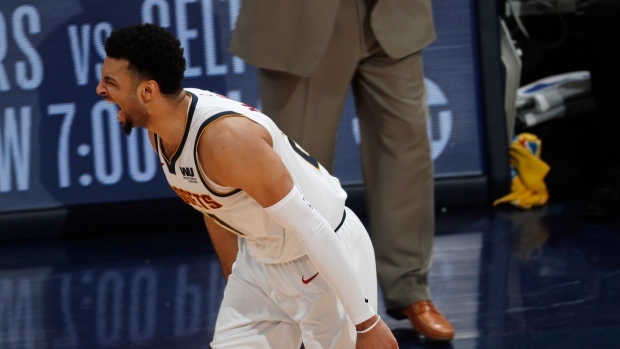 JAMAL MURRAY (Nuggets): He was brilliant in the fourth quarter Tuesday night as Denver came back late to even the series with San Antonio. The young Canadian has had an excellent year for the Nuggets and came up huge in the clutch. I love his ability to score with the ball or moving without it in quick catch-and-shoot opportunities. His creativity and nice handle allow him to get sound scoring chances. His game continues to mature. Producing in a playoff game is a big step for his growth. 2. DeMARCUS COUSINS (Warriors): Tough blow for him and his team with his quad injury. It will be tough to gauge his value as a free agent this summer after two major injuries. Cousins might have to take another short deal or go with longer term for less money if he wants security. He’ll be at the mercy of the market. It’s not an easy decision to make. 3. LOU WILLIAMS (Clippers): When you look around the league at guys who impact the game when they step on the floor, he doesn’t get enough mention. Williams is a stone-cold killer as a scorer. He is so gifted and smart. He’s able to break a defender down with change of pace, crossovers and faders, plus he draws fouls. The crafty guard had 36 points and 11 assists in the breathtaking comeback in Game 2 versus the Warriors. You can’t rattle him. I loved watching him in person for a year in Toronto and always value his skills when I get to watch him now. 4. DAMIAN LILLARD & C.J. MCCOLLUM (Blazers): Congrats to Portland. Two playoff wins must feel great for a long-tortured fan base that is one of the most passionate and best in the league. I love the city and the fans. We all know that guard play is vital for success at every level of the sport. Lillard and McCollum have delivered in a big way, combining for 116 points of the 218 total points scored by their team in the two games. Needless to say, these guys define the very existence of their club. I’m a huge fan of both players. It’s nice to see them finally have their much-deserved playoff success. Still, it won’t be easy closing this series out against OKC without Jusuf Nurkic. 5. DAVID GRIFFIN (Pelicans): Nice to see the former Cavs GM back in the front office in New Orleans. He’s a good basketball man who is very thoughtful. I loved appearing with him on NBA Radio the past few years as an occasional guest. Our discussions about hoops were always thought provoking. He gets it. There will be major pressure on him right away to deal with the Anthony Davis situation and find success in a place that I’m still not sure is a viable long-term NBA market. Griffin has to get things on track and mobilize basketball fans to consistently support the franchise. Winning will surely help, but they’ve got to connect to make it sustainable. It’s a tough sell there.